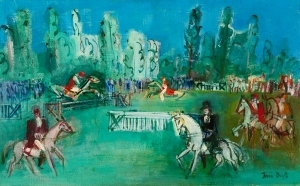 Jean Dufy was a French painter of Parisian society, country scenes, circuses, horse races, stages, and orchestras. He was born in Le Havre, on March 12, 1888 into a large family. 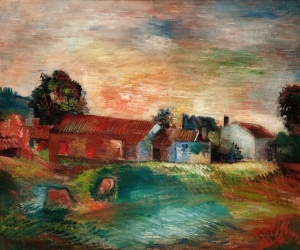 His older brother was the well-known painter Raoul Dufy, who became a mentor throughout Jean’s career. Jean Dufy had received formal education at the École Primaire Supérieure du Havre. In 1920 Dufy settled in the artist quarter Montmartre, next door to Georges Braque. Braque, a friend of his brother Raoul Dufy, encouraged him to experiment with the Cubist style. Another of Raoul's friends, Othon Friesz, exposed him to the Fauve movement. He also spent time there with Picasso, Apollinaire, and Derain, among others. After settling in Montmartre, Dufy participated in many exhibitions which reflected the music and art of Parisian culture after the war. 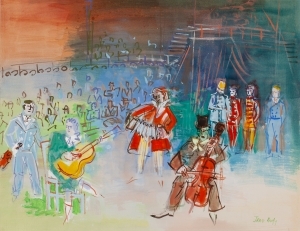 Dufy created colorful paintings of circuses and clowns, as well as Parisian street scenes including horse-drawn carriages, the gates of Paris, the Eiffel Tower, and the bridges of the Seine.